This wonderful one bedroom flat is set on the second floor of a secure building, offering a sizeable reception room with ample space to dine, a separate kitchen and a good-sized double bedroom. Townley Court is peacefully located within easy reach of Stratford Westfield for a wealth of shops, bars and restaurants. 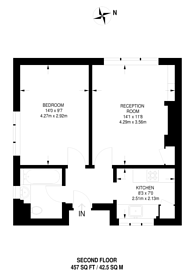 Nearby transport links include, Maryland Station, Stratford Underground Station and Stratford International Station. 457 (42 Sq M) approx.